Rocky Mountain High-Point: Epic Brewery’s “heavy” beers a hit. The empty coolers in the Epic Brewery store should erase any doubt about Utahns’ thirst for high-quality beer. A three-month supply sold out in almost a week, co-founder David Cole says. Luckily, the brewery continues to roll out new beers daily will, hopefully, have those coolers fully stocked again by mid-June. It also has four more stainless-steel fermenting tanks on order and, by midsummer, will have more than doubled its brewing capacity. Epic Brewing, which officially opened its store May 17, is only brewing so-called “heavy” beer—meaning it contains alcohol above the 4 percent by volume (3.2 percent by weight) alcohol limit for “Utah beer.” Epic did so because the challenges of brewing Utah beer are different. “There are other breweries making great 3.2 beer, so we want to focus on making great high-point beers,” Cole says. Indeed, its lowest alcohol beer, the Cross Fever amber, is 4.8 percent by volume. Its highest, on the other hand, currently, is the 9 percent Hopulent double IPA, although Cole says the next bottling of Hopulent is going to be at about 9.7 percent. That’s right, different batches of the same beer are different, which Cole says is to be expected with many beers. Along with higher alcohol, the second Hopulent batch is hoppier because it was dry-hopped with locally grown dried whole hops. Also, the next batch of the 825 State stout will feature a different yeast strain. That experimentation means that drinkers will continually be surprised, but it also means higher costs. 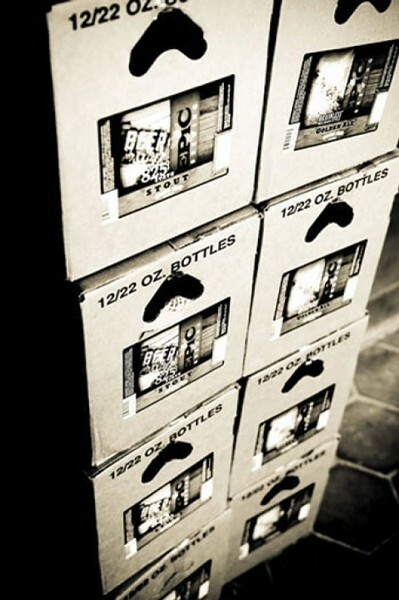 Thus, all of Epic’s beers—bottled in 22-ounce bottles—start at about $3. However, Epic beers are more like a nice bottle of wine, meant for sharing and savoring with friends. You’ll have to take your beer home to share, as Epic currently only sells beer to go. It is not licensed to serve beer on premises. Experimentation will be most noticeable with Epic’s “Exponential Series,” where the brewers take an ethos developed as home brewers—try anything, just for the hell of it—and translate it on a commercial scale. On May 28, Epic began selling the first three Exponential beers: A surprisingly nutty, full-bodied Brown Rice Ale, an Imperial red ale and a Sour Apple Saison. Enough about the philosophy—how are the beers? Personally, I jump straight to dark beers—especially stouts—to garner a first impression of a microbrewery. I first sampled Epic’s 825 State stout and Galloway porter on a beautiful spring evening at The Beerhive following a long (and sadly, alcohol-free) day at the Utah Republican Convention. That kind of insanity demands a drink with serious body—and thankfully, those beers did the trick. The 825 State is one of the better stouts I’ve ever had, ranking (in my mind) with other favorites like Rogue’s chocolate stout. It’s relatively dry, and while there are hints of chocolate, it’s not overly sweet. At a recent Epic tasting party, the stout was perfectly paired with chocolate truffles. The porter, meanwhile, is sweeter than many porters and would work well with a hearty stew. On the other end of the beer spectrum, three beers will be guaranteed crowd-pleasers, especially during the summer months. The Intermountain Wheat is an American hefeweizen that is not nearly as sweet as most hefeweizens, and sour enough that a squeeze from a lemon wedge isn’t necessary. The Cross Fever amber ale is more citrus-y than many ambers, making it a great outdoor beer. Finally, Epic’s Capt’n Crompton’s pale ale—probably my wife’s favorite beer at the tasting—is a classic American pale, dominated by Cascade hop aromas and malty sweetness. All in all, Epic is further proof that, despite Utah’s reputation as a beer-impoverished state, brewing in the Beehive is flourishing. Open Monday-Thursday 11 a.m.-9 p.m.; Friday-Saturday, 10 a.m.-11 p.m.